My in-house camera man aka my husband has only recently been restored to the post after various misdemeanours at recent cycling events such as forgetting to recharge his camera’s battery, failing to insert the memory card and deleting a batch of photographs before they were saved. He is now on probation and, to get back into my good graces, has snapped away in all weather conditions down in the Basque country. 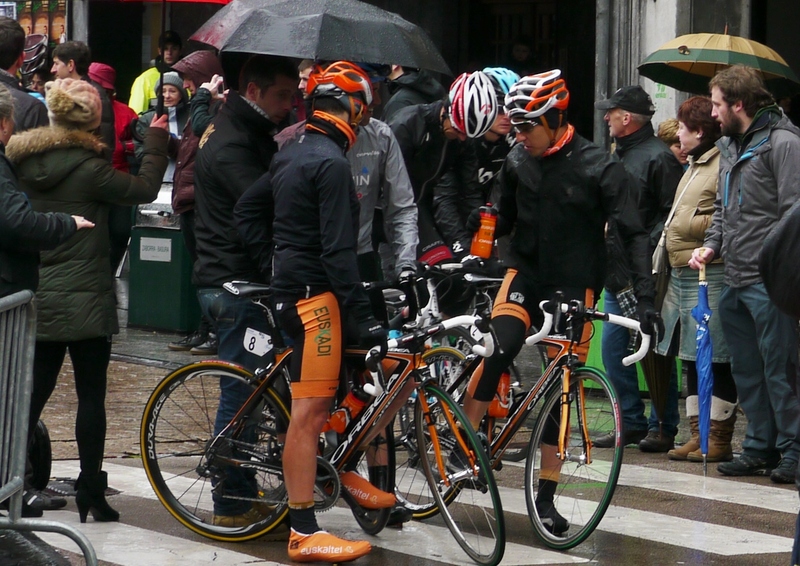 All the photographs were taken at the recent Vuelta al Pais Vasco, where you’ll note the weather worsens considerably as the race progresses. 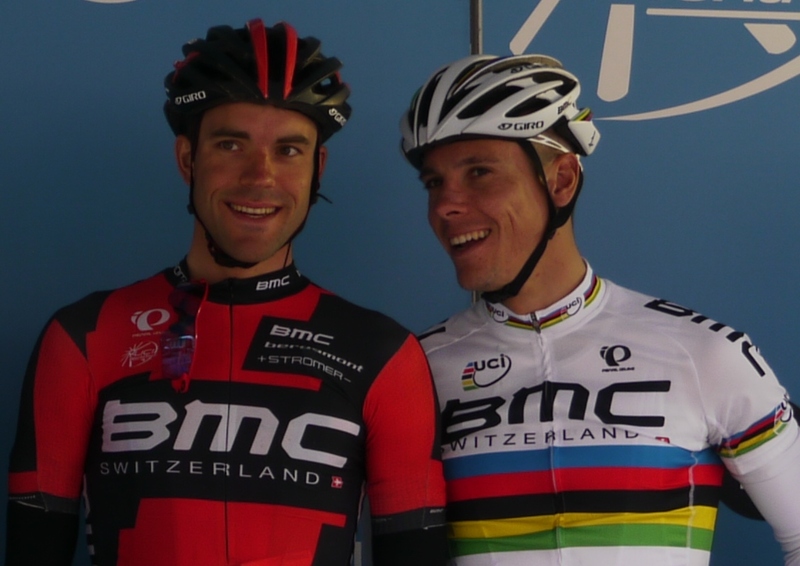 We’re starting with two ‘local’ boys – local to me that is as they both live on the Cote d’Azur – from BMC who were refining their form and teamwork ahead of the all-important Ardennes classics. 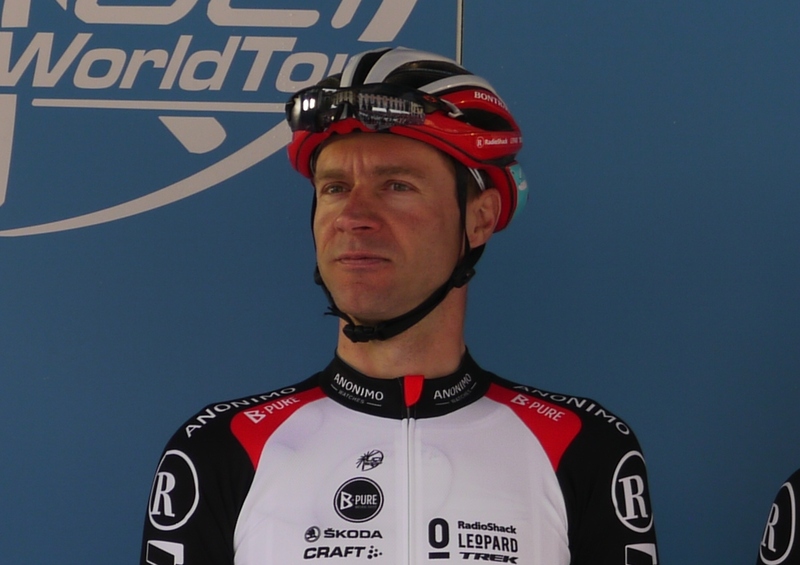 Another popular rider with the Basque public, RadioShack’s Jens Voigt, who’s already seen the weather forecast and is relishing the challenge. 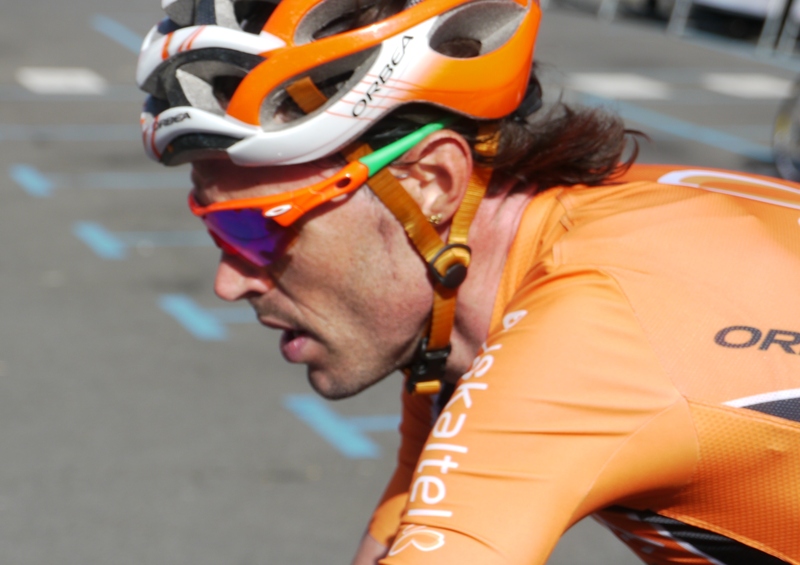 You’ll be unsurprised to learn that he was one of the 70-odd riders to finish the race. And again my deepest respect and love for the amazing basque fans, they had to fight the rain and the cold just like us riders!! Thank you!! Here’s Giro d’Italia 2012 champ Ryder Hesjedal, whose name proved to be a bit of a tongue-twister for the Spanish announcers! 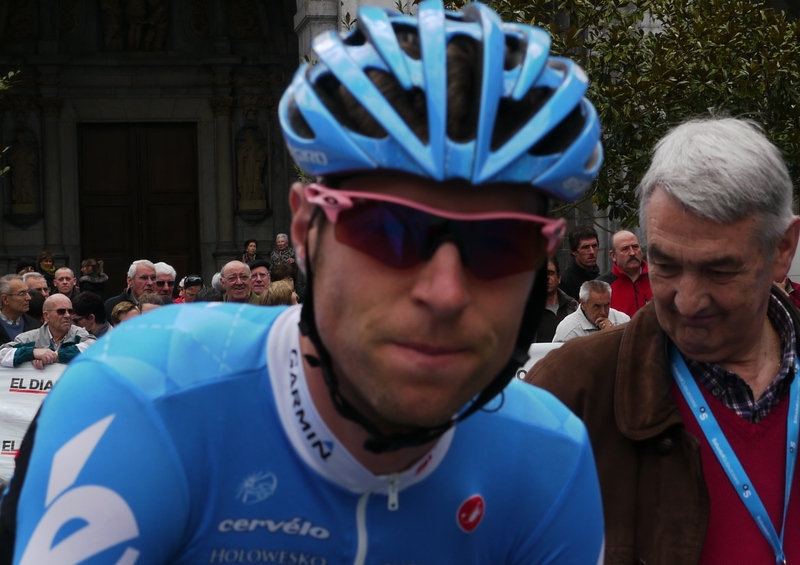 He was working for young gun Andrew Talansky who had a nasty spill on Thursday just after the finish line in Eibar-Arrate. 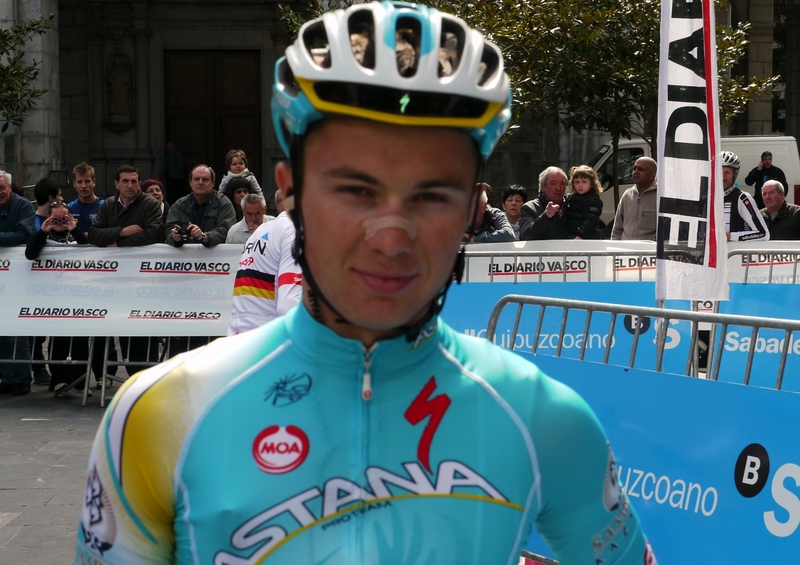 Shy smile from Alexey Lutsenko, one of the younger riders taking part in the race. 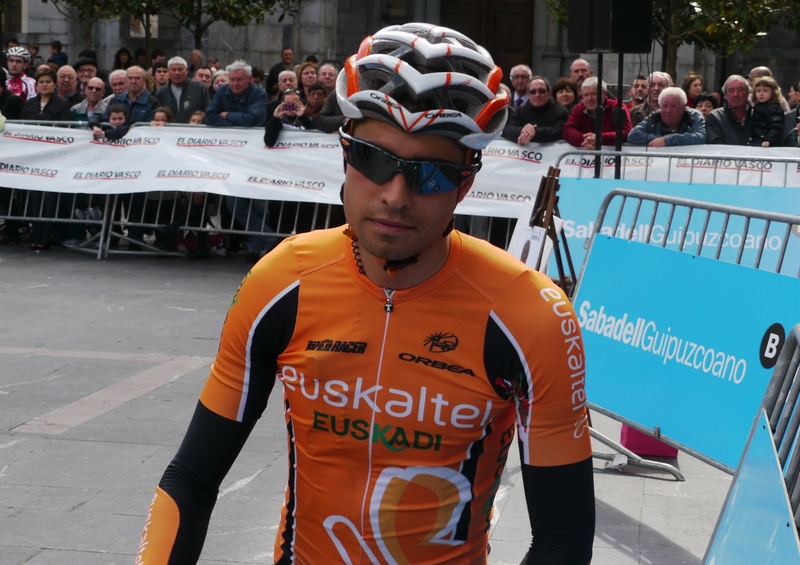 Amets Txurruka, now with Caja Rural, spent most of the race out front and got a lock down on the mountains and sprint jerseys. 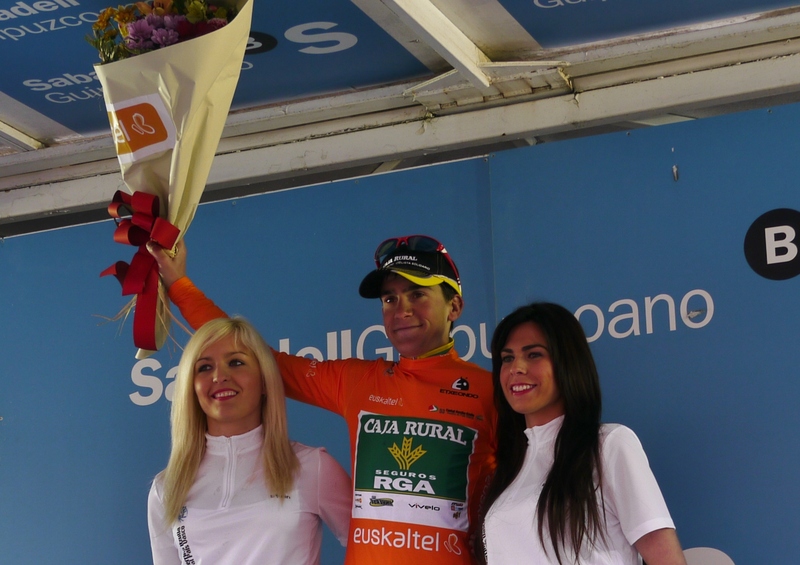 Ironically the latter was sponsored by his former team Euskaltel! 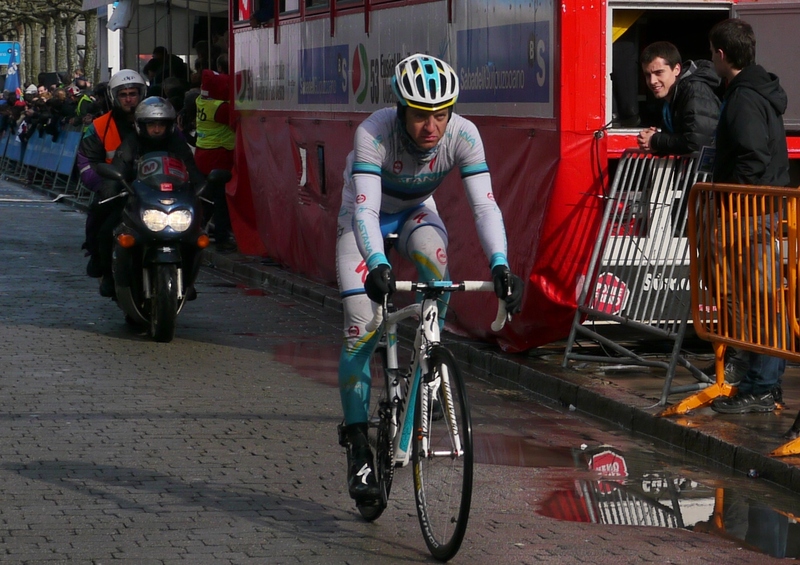 A number of riders fell, losing time and sliding out of contention in the overall. Rein Taaramae was one of those! I love how the various nationalities have a pre-race catch up, though of course some riders just prefer to collect their thoughts and think about the day’s challenges. Time-trial world champion Tony Martin was there to win Saturday’s individual time trial. He succeeded despite it being on a parcours which didn’t favour him. Much was made of the steep finish on Wednesday. Most of the boys were gratefully grabbed at the top by their soigneurs as they slumped exhausted over the handlebars. 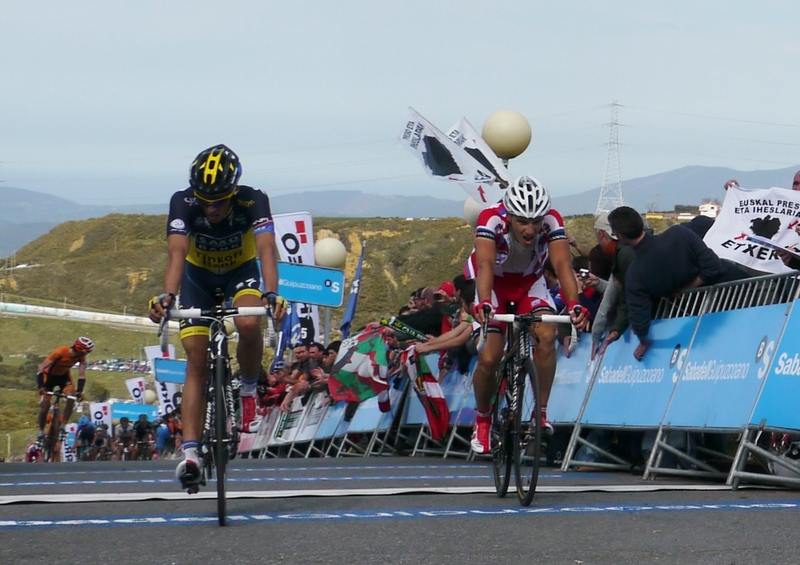 The winner of that stage got a massive cup and one of those big, black, floppy Basque berets: txapala. The local press felt that Sky had been disrespectful by failing to show up for the team presentation, bringing a team of six not eight riders and signing on late for the first two days! However, all was forgiven when they started winning stages. 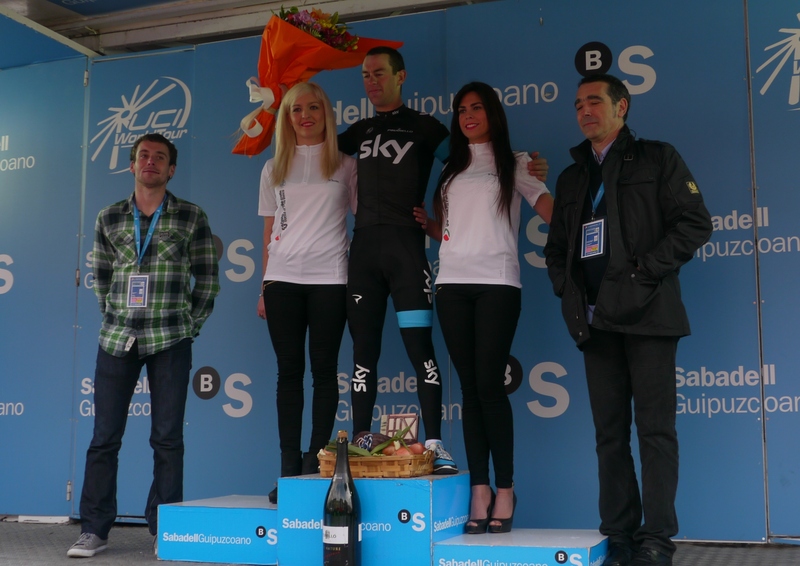 I’m assuming Richie Porte handed his goodie box for winning straight to Sky’s chef in a scene reminiscent of Ready, Steady, Cook. I have to wonder what Soren made with the enormous black sausage – obviously a local speciality – leeks, onions, potatoes and apples. 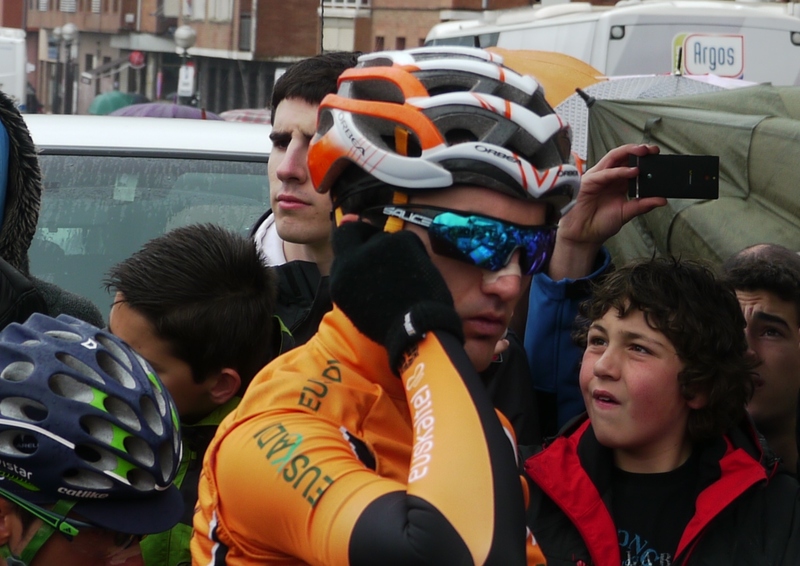 Or was it a cunning Basque plan to slow Richie down in the following day’s time trial? As the week progressed the boys started bundling up in frankly anything they could lay their hands on as the temperatures plummeted. On one day we had weak sunshine, torrential rain, hail and snow! 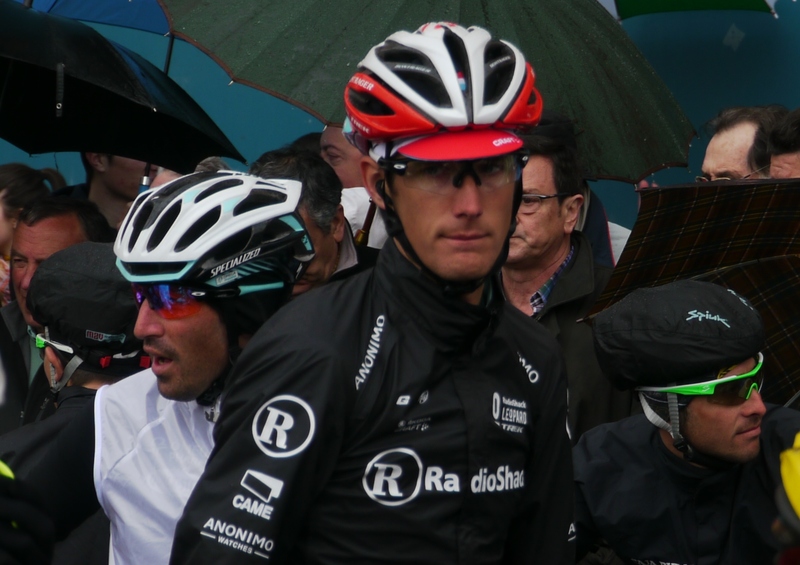 It was good to see Andy Schleck back in action, he even got in a break, and while he was a DNF, so were 70-odd others! At MotoGP glamorous scantily clad lovelies hold an umbrella over the heads of the riders before the start to spare them the searing heat of the sun. Cycling has to make do with a mate with a brolly. 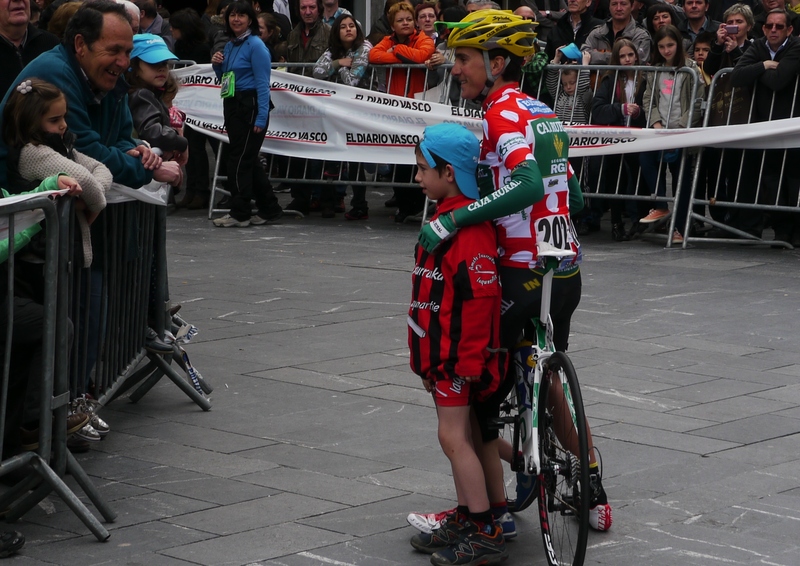 I have no idea what they were chatting about, admiring Koldo’s bike? I love that Igor Anton has tape around the top of his shoe covers in trying to keep out the rain. I should have checked with him whether or not it works. 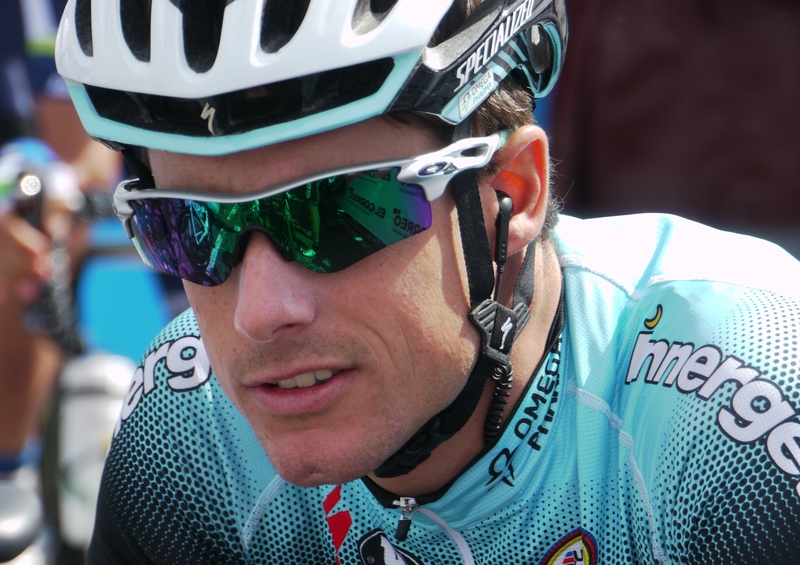 No one from Argos-Shimano finished the race. I think it was because they ran out of clean dry kit! Tanel Kangert‘s soigneur told me that this kit was going straight in the bin as it would be impossible to restore it to its former glory. 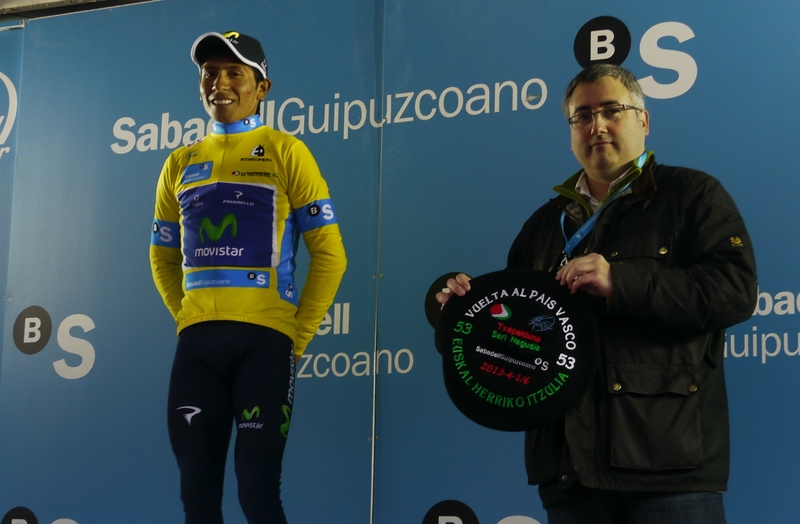 It’s only fitting that the final photo is of the winner Nairo Quintana. Isn’t that a great smile?